Fremont's historic downtown is listed in the National Register of Historic Places. 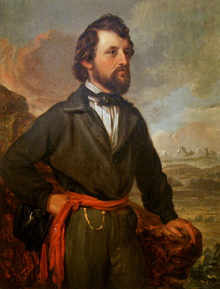 John C. Fremont is the city's namesake. From the 1830s to the 1860s, the area saw a great deal of traffic due to the Mormon Trail, which passed along the north bank of the Platte River. A ferry connected the two banks of the Elkhorn River near Fremont. It was a major overland route for emigrant settlers going to the West, the military and hunters. Fremont was laid out in 1856 in anticipation that the railroad would be extended to that site. It was named after the American explorer, politician and military official General John C. Frémont. By 1857, there were 13 log houses in the town. The Union Pacific Railroad reached the town in 1866 becoming the first railroad into the future rail hub. Sioux City and Pacific Railroad completed track into the town in 1868 with the Elkhorn Valley Railroad arriving in 1869. Fremont gained national attention in 2010 when residents approved a referendum that would ban illegal immigrants from renting and working in the town. Fremont is located along the Platte River, approximately 35 miles (56 km) northwest of the largest city in the area, Omaha, and 50 miles (80 km) northeast of the state capitol, Lincoln. According to the United States Census Bureau, the city has a total area of 8.85 square miles (22.92 km2), of which, 8.80 square miles (22.79 km2) is land and 0.05 square miles (0.13 km2) is water. Fremont is quite flat, lying in the river plain between the Platte and Elkhorn rivers, at an elevation of approximately 366 meters (1,203 ft) above sea level. Fremont is the county seat of Dodge County, Nebraska, and is likewise the financial and social center of the area. Facilitated by the completion of the US Highway 275 and Highway 30 bypass around Fremont, from Omaha, eastern Fremont is growing rapidly as a bedroom community for Omaha (see links to air photos below). As of the census of 2010, there were 26,397 people, 10,725 households, and 6,862 families residing in the city. The population density was 2,999.7 inhabitants per square mile (1,158.2/km2). There were 11,427 housing units at an average density of 1,298.5 per square mile (501.4/km2). The racial makeup of the city was 89.2% White, 0.7% African American, 0.6% Native American, 0.6% Asian, 0.3% Pacific Islander, 7.1% from other races, and 1.6% from two or more races. Hispanic or Latino of any race were 11.9% of the population. There were 10,725 households of which 31.6% had children under the age of 18 living with them, 47.8% were married couples living together, 11.2% had a female householder with no husband present, 4.9% had a male householder with no wife present, and 36.0% were non-families. 30.2% of all households were made up of individuals and 13.4% had someone living alone who was 65 years of age or older. The average household size was 2.38 and the average family size was 2.94. The median age in the city was 38 years. 24.2% of residents were under the age of 18; 9.9% were between the ages of 18 and 24; 23.9% were from 25 to 44; 24.7% were from 45 to 64; and 17.3% were 65 years of age or older. The gender makeup of the city was 48.5% male and 51.5% female. As of the census of 2000, there were 25,174 people, 10,171 households, and 6,672 families residing in the city, which makes it the 6th largest city in Nebraska. The population density was 3,393.3 people per square mile (1,309.9/km²). There were 10,576 housing units at an average density of 1,425.6 per square mile (550.3/km²). The racial makeup of the city was 95.28% White, 0.57% African American, 0.31% Native American, 0.61% Asian, 0.11% Pacific Islander, 2.29% from other races, and 0.82% from two or more races. Hispanic or Latino of any race were 4.31% of the population. There were 10,171 households out of which 30.7% had children under the age of 18 living with them, 53.0% were married couples living together, 9.4% had a female householder with no husband present, and 34.4% were non-families. 29.1% of all households were made up of individuals and 14.0% had someone living alone who was 65 years of age or older. The average household size was 2.38 and the average family size was 2.93. In the city, the population was spread out with 24.2% under the age of 18, 11.0% from 18 to 24, 26.7% from 25 to 44, 20.7% from 45 to 64, and 17.4% who were 65 years of age or older. The median age was 37 years. For every 100 females, there were 90.8 males. For every 100 females age 18 and over, there were 86.8 males. The median income for a household in the city was $36,700, and the median income for a family was $45,259. Males had a median income of $31,865 versus $21,035 for females. The per capita income for the city was $18,006. About 5.1% of families and 8.8% of the population were below the poverty line, including 10.1% of those under age 18 and 7.2% of those age 65 or over. As of 2016, Fremont's single largest employer was Hormel Foods, with an estimated 1000–1500 workers, whose hog-processing plant has been described as "the nation’s largest producer of Spam." The next-largest employers were Fremont Health Medical Center, Fremont Public Schools, and Nye Health Services, each with an estimated 500–1000 employees. The Louis E. May Historical Museum is housed in a Victorian house built by Fremont's first mayor, Theron Nye, in 1874. A log cabin on the site is an example of the type of dwelling in which the earliest pioneers lived who moved to Nebraska as part of the Homestead Act. Historic downtown Fremont is known for its numerous antique stores, and a collection of historical buildings. Several local buildings are on the National Register of Historic Places (NRHP). Among these is the Love-Larson Opera House on Broad Street, built in 1888. Later used as apartments and a grocery store, it was restored for theatre use by a non-profit group in the 1970s, and again in 2003 by the Fremont High Drama Club. The county courthouse is the center of justice for the area. Each summer, in July, Fremont spends a long weekend celebrating John C. Fremont Days, which is a celebration of Fremont's history through a parade, Chautauqua, rodeo, classic car show and local vendors selling their handmade crafts. It draws attendees from around the area for both historical and social reasons. For recreation, the Fremont Lakes State Recreation Area (also known as "the State Lakes") attracts boaters, skiers, fishermen and beachgoers from the area to the group of 20 man-made tree-lined lakes which cover nearly 700 acres (2.8 km2), along the Platte River. Two regional Boy Scout camps, Camp Cedars and Camp Eagle, are located near Fremont, along the Platte River. Fremont forms part of the Nebraska Statewide Arboretum collection. Fremont has 21 city-owned parks, with a combined area of over 400 acres (1.6 km2). Located in the northwest corner of Fremont near the "Washington Heights" neighborhood is the Fremont Golf Club (FGC). The FGC was completed in 1930 and features 6,390 yards (5,840 m) of golf from the longest tees for a par of 71. In 2007 construction of the "Splash Station" water park was completed. The park cost an estimated $5.1 million and features an interactive train slide, combination lap pool and wave pool, body slide and speed slide. Fremont is the home of the undergraduate liberal arts college, Midland University, which houses the Musbach Art Center, among other attractions. The Metropolitan Community College system has a community college campus in Fremont as well. There is one public high school, Fremont Senior High (part of the Fremont Public School System), one private school, Archbishop Bergan Catholic School (Pre-K-12), and one private elementary/middle school, Trinity Lutheran School. ^ "City Council". City of Fremont. Archived 2012-05-10 at the Wayback Machine Retrieved 2012-05-22. ^ "Fremont, Dodge County". Center for Advanced Land Management Information Technologies. University of Nebraska. Retrieved 7 August 2014. ^ "Profile for Fremont, NE". ePodunk. Retrieved 7 August 2014. ^ Bowman, J. R. (1882). Shearer, Frederick E., ed. The Pacific tourist. J.R. Bowman's illustrated transcontinental guide of travel from the Atlantic to the Pacific Ocean. New York: J.R. Bowman. p. 23. OCLC 752667534. Retrieved 9 May 2018. ^ Davey, Monica (2010-06-21). "Nebraska Town Votes to Banish Illegal Immigrants". The New York Times. Retrieved 2010-06-22. ^ Dwyer Arce (2010-06-22). "Nebraska city voters pass ban on hiring, renting to illegal immigrants". JURIST - Paper Chase. ^ United States Census Bureau. "Census of Population and Housing". Archived from the original on May 12, 2015. Retrieved June 23, 2013. ^ "Annual Estimates of the Resident Population: April 1, 2010 to July 1, 2012". Archived from the original on October 19, 2013. Retrieved June 23, 2013. ^ a b "Fremont Area Major Employers" (PDF). Greater Fremont Development Council. Retrieved December 7, 2017. ^ Grabar, Henry (December 6, 2017). "Immigrants Could Save the Only Town in America That Passed a Law to Keep Them Out". Slate Magazine. Retrieved 2017-12-12. ^ "ARMSTRONG, William Lester, (1937 - )". Biographical Directory of the United States Congress. Retrieved October 6, 2012. ^ "Susan Bierman". Fremont Tribune. August 10, 2006. Retrieved 2016-12-31. ^ "Harold Eugene Edgerton". Nebraska Genealogy. Retrieved October 6, 2012. ^ "Marg Helgenberger". IMDb. Retrieved October 6, 2012. ^ "Sen. Charlie Janssen (R-Nebraska) biography". Congress.org. Retrieved October 6, 2012. ^ "'Obamacare's Nebraska Nemesis'". National Review. January 9, 2014. Retrieved 2017-12-12. ^ "Julie Sommars". Metacritic. Retrieved June 27, 2015. ^ "Sloppy Thurston". Baseball-Reference.com. Retrieved October 6, 2012. ^ "Zach Wiegert". Pro-Football-Reference.com. Retrieved October 6, 2012.